Arthurs Seat is a mountainous and small district located within the Shire of Mornington Peninsula. It is a popular tourist destination known for its natural bushland, sweeping views, man-made attractions, and state-of-the art gondolas. The Aboriginal Boonwurrung name for the hill is Wonga. It was named by the Indigenous tribe in the Mornington Peninsula (also known as Boonwurrung people) who have been a part of Australia’s culture for over 40,000 years. In 1802, British explorers came to Port Philip Bay and subsequently renamed the hill Arthurs Seat due to its resemblance to Arthurs Seat Hill in Edinburgh, Scotland. English navigator and cartographer, Captain Matthew Flinders, was the first European to scale Arthurs Seat. He was the leader of the first circumnavigation of Australia and was also responsible for identifying Australia as a continent. He climbed the highest point near the shores of the southernmost parts of the bay, where the ship had entered through The Heads. Access to the highest point of the hill was through Red Hill until the dirt track ascending the summit from Domana was opened to the public in 1929. In 1931, Howard Lawson developed the Garden of Moon, offering several attractions such as a dance hall, camera obscura, giant telescopes, swimming pool, donkey rides and a wishing well. This became a gateway to bringing tourism to Arthurs Seat. In 1960, a chairlift ascending to the summit was opened by Dr. Vladimir Hayek due to the growing State Park’s popularity. The lift was closed in 2006 and the infrastructure was dismantled in the late 2012 and early 2013. 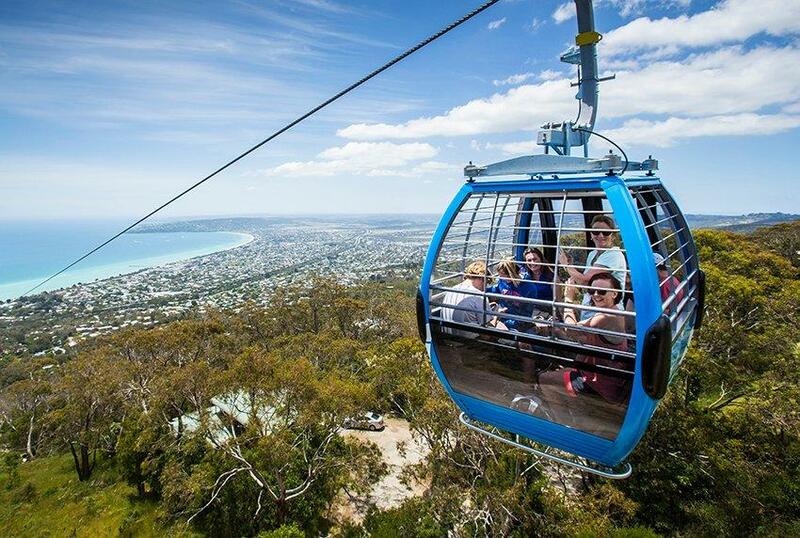 In December 2016, Arthurs Seat Eagle was opened to the public and has become a popular attraction among tourists. It carries passengers between the Base Station in Dromana to the summit of Arthurs Seat, passing above the magnificent bushland of the State Park. The state-of-the-art gondola lift is a combination of enclosed and open cabins providing an all-weather experience for its passengers. It is an all-inclusive ride catering to the disabled, elderly, frail and toddlers. It is also wheelchair and pram friendly. Located at the Summit Station, Eagles Café gives its visitors a meal with a view from its huge all-weather deck that lets you dine outdoors or sit inside the warm café and enjoy the view through the large windows. They offer heartwarming and delicious food including award winning pies, fresh gourmet rolls, sandwiches, salads and wraps, warm scones with jam and cream, and locally baked goods. They also have a range of healthy and hearty food, as well as some fantastic gluten-free and vegetarian options.